Interactive storytelling is in it’s infancy. There are no defined ‘styles’. Yet The story of Kennedy and Oswald by National Geographic might represent a future genre in visual storytelling styles. It tells the parallel life stories of Jack Kennedy and Lee Harvey Oswald. Nobody considered Killing Kennedy brilliant. The docudrama by National Geographic, based on the eponymous novel by Bill O’ Reilly, was considered ‘okay‘. Rob Lowe appeared ‘smaller than real life‘ in his role as JFK. Even so the bad critics didn’t hurt National Geographic a bit: viewer ratings were fabulous. As with most TV-productions, National Geographic wrote an online counterpart with some extras. In this case they told the story of the main two characters of the drama: Jack Kennedy and his assassin Lee Harvey Oswald. They called it ‘an in-depth interactive documentary’. It worked brilliant. The lives of the two men turned out to be eerily alike at times. 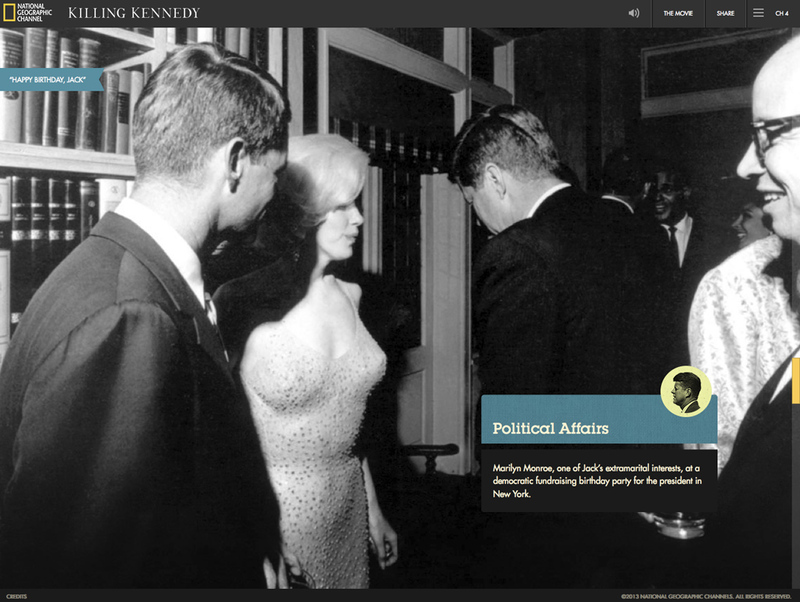 But for journalists and designers the visual storytelling style is a case study in itself. 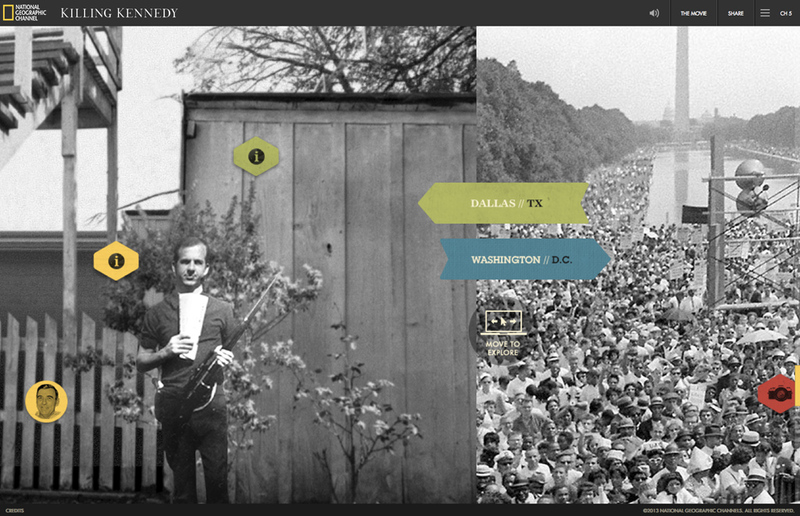 What sets The Story of Kennedy and Oswald apart as visual storytelling style? It uses the full screen for interactive visuals – not a magazine style like the Infamous Snow Fall story. The two stories develop simultaneously – the reader decides how to follow the story lines, without getting his wires crossed. Audio keeps up the pace and creates ambiance, by which it does feel like watching a documentary at times. The interactivity isn’t too bad. 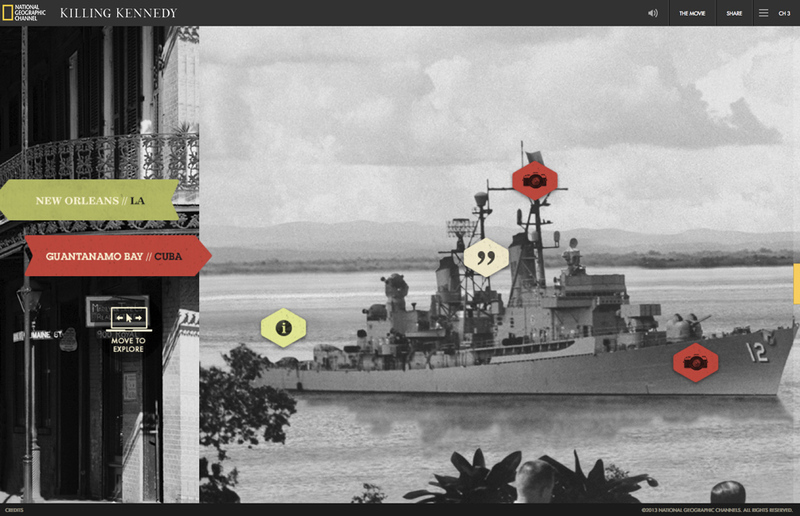 Interactive buttons float on historical black and white photos, without leaving a messy impression. The buttons are cleverly grouped and styled in a nice and functional fashion. It’s not easy to scroll through the story quickly. As it’s a bit of a read, one might want to read it in parts. The six chapters in the menu on the righthand side help out a bit. Some interactive elements waver, and sometimes you have to chase a button if you want to click on it. Annoying, that’s right. So how should we name this visual storytelling style? Altogether The Story of Kennedy and Oswald is more than an ‘enriched powerpoint presentation’. It’s not an ‘interactive documentary’ either- I’m convinced we are going to see beautiful examples of that in the future. Is it an ‘Unmanned Interactive Lecture’ (UIL) we are looking at? Far better suggestions are warmly welcomed.